Well that last post was so depressing, I didn't want to leave it on top and I just remembered I had this ice cream truck story. The guy showed up in the McCompound a few days ago. It was a warm day and the snobby girl and her boyfriend are moving out and had a bunch of guys helping. One of the guys stopped the truck and then the people started pouring in. I haven't seen one in years and this one was really funny. 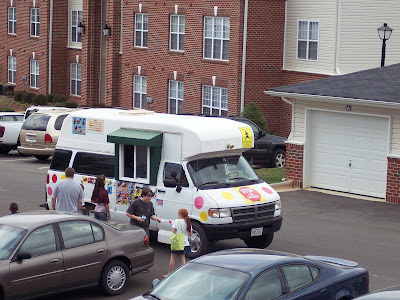 It had the usual kind of tinny music but really loud and it didn't play one jingle like the old Mr. Softee truck used to. It played a medley of really odd tunes. It was so there so long, I wrote them down. Waltzing Matilda. Clementine. Polly Wolly Doodle. White Christmas. If You're Happy and You Know It. It's a Small World. Row Your Boat. London Bridge. Oh Susannah. It rolled off playing Saints Go Marching In. I wondered if he picked the tunes himself. I of course bought an ice cream even though the selection sucked and it wasn't very good. Not to mention it was expensive. Buck and a half for an ice cream bar on a stick and that the cheapest thing. The big popsicles were three bucks. Still it was fun to get it for the nostalgic value. He came again the next day but it was pouring rain. He didn't make any sales and hasn't been back since.